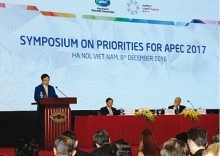 The six countries and territories of APEC with large capital investments in Dong Nai are: The Republic of Korea, Chinese Taipei, Japan, Singapore, Thailand and China. Leading the APEC bloc investors in Dong Nai are the Republic of Korea (more than US$ 5.5 billion), Chinese Taipei (more than US$ 5.2 billion), Japan (nearly US$ 4 billion) and Singapore (nearly US $ 2.3 billion). The six-day (November 6-11) APEC 2017 Summit in Da Nang, themed "Creating New Dynamism, Fostering A Shared Future," aims to liberalize, open up trade and investment, encourage economic and technical cooperation, and facilitate a favorable business environment. APEC was established in 1989 with 12 member economies. It now has 21 members, representing 2.8 billion people and 57% of the world's total GDP (2014). The members are: Australia, The Republic of Korea, Japan, Chinese Taipei, Singapore, China, USA, Thailand, Vietnam, Russia, Malaysia, Philippines, New Zealand, Brunei, Mexico, Peru, Chile, Hong Kong (China), Papua New Guinea, Canada and Indonesia. 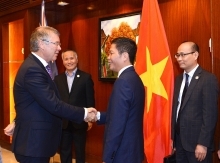 Vietnam joined APEC in November 1998.